Creative Diagnostics now offers high quality Tetanus (Clostridium tetani) antigens, antibodies and ELISA kits for research use. Tetanus is a nervous system disease caused by a toxin (tetanospasmin) produced by Clostridium tetani. Tetanus is divided into four clinical types: generalized, localized, cephalic, and neonatal. C. tetani is an obligately anaerobic bacillus. 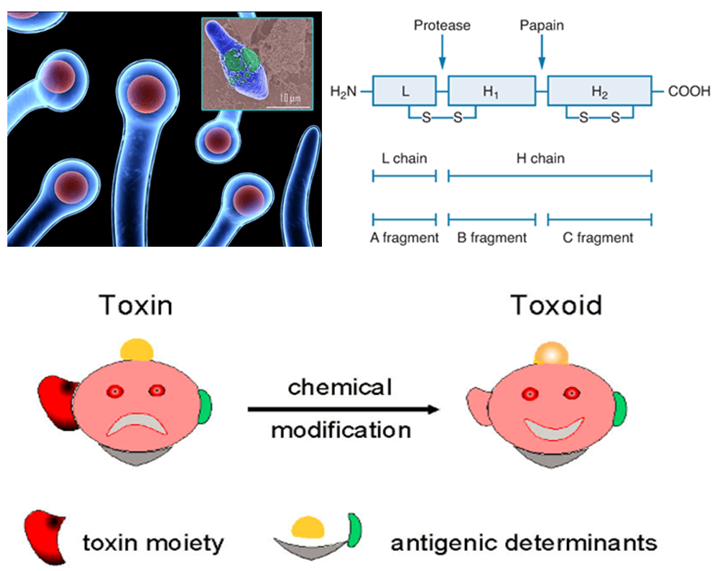 Tetanus produces two toxins: tetanospasmin (toxin) and tetanolysin. It develops a terminal spore that is extremely stable in the environment, retaining the ability to germinate and cause disease indefinitely. During growth, the bacilli possess abundant flagella and are sluggishly motile. Two toxins, tetanospasmin (commonly called tetanus toxin) and tetanolysin, are produced during this phase. Tetanospasmin is encoded on a plasmid that is present in all toxigenic strains. Tetanolysin is of uncertain importance in the pathogenesis of tetanus. Mature organisms lose their flagella, develop a terminal spore, and begin to resemble a squash racquet. Tetanospasmin is synthesized as a single 151-kDa chain that is cleaved extracellularly by a bacterial protease into a 100-kDa heavy chain and a 50-kDa light chain (fragment A), which remain connected by a disulfide bridge. The heavy chain can be further divided into fragments B and C by pepsin. The heavy chain appears to mediate binding to cell surface receptors and transport proteins, whereas the light chain produces the presynaptic inhibition of transmitter release that produces clinical tetanus.